Getting back in the groove after vacation can be torture! We are talking about undoing a pile of mail, a pile of laundry and a seriously un-fun getting back to work routine. It is especially hard if you are not organized. Here are some tips to get back to to the swing of things quickly. Set aside time to get back to your routines. As much fun as vacationing to the very last minute can be, return a smidge early from your holiday. Fly home in the morning so you can take the rest of the day to be picking up mail, starting your laundry and unpacking your suitcase. You will also be ready to get in bed on time to get back into your morning routines. Getting in at the last minute means you are up late, not as well rested and generally rushed to get back to work and life. Get mail and email under control first. For mail, toss/recycle as much as possible. On a “regular” week you might want to scan newspapers and ads. When you are returning from your vacation, simply recycle those items. You will not be ready to act on coupons or flyers, so recycle these asap. Put the bills in the regular spot, but decide that you are taking a break from anything extra in the paper department this week. Some of us check email on our blackberry while away and some don’t. Hit delete to get back to basics. Just decide what is really important those first days after your holiday. Otherwise, a quick response will do. Being “brutal” makes the difference for both mail and email. Laundry is a serious obstacle after a holiday. Treat yourself to the “fluff and fold” at the local laundromat. It is the way to get back to the baseline on laundry as soon as possible. Unload the laundry first and get it started, then get back to your suitcase in the next day to unload the rest. If it is really tough to unload, take one day for toiletries, one day for hanging clean clothes and one day for shoes. Procrastinating on emptying your luggage does not make your return easier. And most important – get back to your routines right away. We all love the feeling of being flexible, free and under no obligations. Getting back to your home, work and life require routines. Bite the bullet and get back to your’s so you are really ready to buckle down. Get in bed at a good hour, get your bag together for work, and eat a good breakfast to get on your way. You will be glad you did! 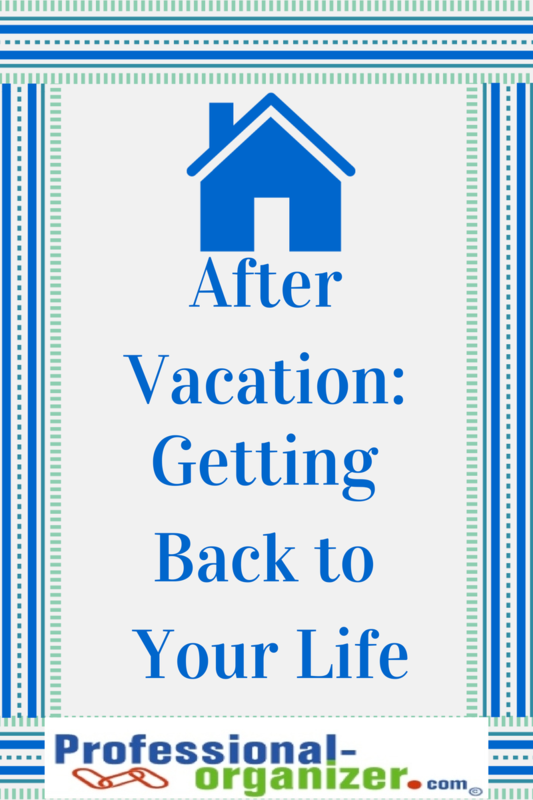 What works best for you to get back to reality? Join my newsletter and enjoy a dose of organizing tweaks monthly! This weekend I had the opportunity to visit my niece Hallie for a very special occasion, her high school graduation. One look in her room and closet, and I knew she had the organizing gene! No clothes on the floor and order inside her closet. I asked her about her successful organizing techniques and what she would share with other teen girls, especially about her folding and laundry tips. First off why stay organized? Clutter is annoying and it wastes time. I don’t like the way mess looks. How does laundry get done in your home? My step dad gets it in the washing machine and dryer and then I fold and hang my own clothes. It is either in my parent’s room or I go get it and bring it into my own room. Once it is on my bed, I separate it by shorts, tee shirts, and things to hang or things to put in drawers. I hang each type of clothing all at the same time. Its quick and I do it fast! If my friends are unorganized, I help them organizing their rooms. They get very overwhelmed. But big thing is that they leave it all to do at one time. I like to organize as I go along and as a process. I do it in small steps so it is easier to do. Just a little at a time and then you get it done. Then you can do others things with your time. One of the problems is too many clothes too. I understand wanting to have enough clothes but only buy something if you are going to use it. There is not so much to do at one time if you have fewer clothes. What about organizing and other parts of your life? I am organized about school stuff too and that is the key to success and good grades. You have everything you need and you can turn it in on time. If you are organized in class, you know what materials to study and you’re on top of your homework. What about stress and organizing? Being organized is a lot less stressful and much easier on everyone. Not so much, just more organized than other people. And everything does not need to be perfect but material stuff helps to be organized. Are you born organized or did you develop this? Of course my mom and you influenced me a lot. Watch Hoarders and you won’t want to be them. Hoarders is enough to make you want to be organized. Hurricane season has already begun! Ever since Katrina and New Orleans years ago, we are all on alert for the worst. Our family is vigilant about hurricanes due to Ike as well. We were without power for 14 days! With this in mind, here is our family preparedness check list. Not sure where to start? I suggest baby steps! Organize your papers first in a fireproof safe. Make a plan depending on whether you are staying or going. Take it step by step to be ready. Prepare and check when daylight savings time begins and ends! Communicate your family plan to another family friend or relative. For paper documents, place originals in safe or safe deposit box and carry copies with you. 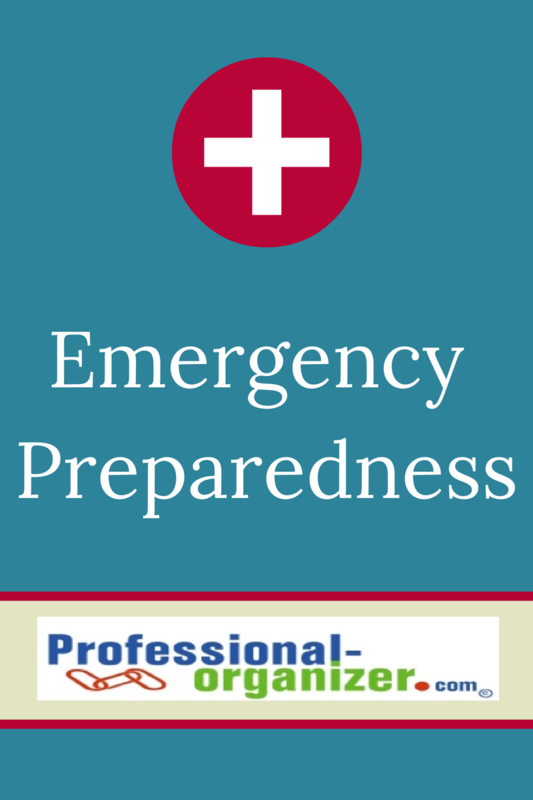 Here are some amazing websites for preparedness too! Our family celebrates big and little events in life! Whether a birthday, anniversary or holiday, family traditions mean everything to us. It is gathering together and enjoying our time that makes an event special. And we like to keep things super simple! Create your team. Special events are even more fun when everyone has a part in preparing. Set the date together with your family and talk about how each family member can contribute. Decide on all the required tasks, from food preparation to decorations, and divide and conquer. Write all the dates on a calendar so that everyone knows when to get their jobs complete. Use the internet to send invitations. Both www.evite.com and www.paperlesspost.com offer ways to invite your guests. This inexpensive solution offers your guests the ease of response and keeps costs down. The little things can make a difference. Get your playlist ready on your ipod and gather new scented candles for the kitchen and bath. Food is an important part of the fun. Keep it simple with easy recipes and ready made goodies. Fresh simple ingredients make it healthy too! Prepared hummus and veggie chips, cheese squares, and fruit make for yummy summer treats. Get prepared ahead of time. Shop a week in advance of your party. Work backwards a day for set up of tables and decorations. Prepare your goodies a day ahead and refrigerate or freeze. The best part of keeping things simple is that YOU get to enjoy the party! It is the real reason to gather people together. Greet your guests as they arrive and encourage them to mingle and help themselves to goodies. In the end, enlist a clean up crew so you are not the only one finishing up with the trash and dishes. Put on some fun music and keep the party going as you clear away the debris. Keep from reinventing the wheel for each event. Start a celebrations notebook that includes a list of food and fun for each event. What a fun new tradition to keep celebrations going! Life has a way of “happening!” You just never know when an emergency is going to come along. So what do we need to be organized just in case? Our family recently had a medical emergency of this unforeseen type. We rushed to the hospital with the bare minimum for a day or two stay. First and most importantly we had our medical information organized. Our family has only a few medications and a few allergies, but this is the first thing you will be asked when a situation occurs. Have a list of all these for each family member printed and placed in your car . Medical insurance cards are critical to keep in your wallet. So be sure you have your most recent with you. We want to stay in touch and communicate with family, friends, church pastors and doctors. I love that we can keep all these numbers handy in our cell phone! We also have an emergency contact list for our family including email addresses, work phone numbers and a few other details. Need lists for medical information or contacts? I love www.listplanit.com. Check it out! Speaking of our phone or other technology, be sure to bring your charger and other attachments to keep everything up and running. Having one extra charger is a small price for staying in touch. I spent the night there with my husband. I always have a travel kit ready to go. It has all the basics in it, in small containers, including a nail file and bandaids. I dropped this and a few items in my bag and off I went. It really provided peace of mind to me to be ready at a moment’s notice. And that is what being organized is all about!